Andy Ockershausen:	This is Andy Ockershausen and I cannot tell you, you listeners, I hope you all are paying attention, how important it is to me and how it important it is to Our Town to have this gentleman on our program. “The Coach of All Time,” I call him. He’s the most winningest coach in history for the state of Maryland, high school. He’s won over 400 games. He’s recently retired, although he’ll never retire, and he’d still be winning games. Bob Milloy, the coach of all time. He’s in the Sports Hall of Fame, the Maryland Hall of Fame, the Coaches Hall of Fame. He should be in everybody’s hall of fame. He’s a local guy. Welcome to Our Town, Bob Milloy. Coach Bob Milloy:	Thank you so much for that terrific interview. Andy Ockershausen:	You hear that all the time. Coach Bob Milloy:	It kind of set me back on my heels. I don’t know how to follow up on that. Andy Ockershausen:	Don’t tell me Milloy, you know what it is. You go to, I know, the sports banquets. You know what it is with the Sports Hall of Fame, I was there. You’re even a member of the Jocks Hall of Fame, which is bigger to me than that, of course. That’s all your guys, all those sports guys you grew up with, went to school with. You’re a graduate of the University of Maryland, how about that? Coach Bob Milloy:	Yes, sir. I am a local guy. I was listening to your podcast with, was it Donald Graham? Coach Bob Milloy:	He talked about McLean, I guess he was a big real estate guy around here, right? I grew up in McLean Gardens and it’s obviously named after his family, right? Andy Ockershausen:	That’s right. You’re Our Town guy. Coach Bob Milloy:	No question, yeah. Andy Ockershausen:	I knew your dad real well. He was in the automobile business for years. So respected by everybody. But way back, I did not know until today, that you were a St. John’s guy. Coach Bob Milloy:	Went to St. John’s. I started off, went to St. Anne’s then Blessed Sacrament when we moved and went to B.S. Andy Ockershausen:	St. Anne’s is right on Wisconsin Avenue, right? Coach Bob Milloy:	Right. I don’t think it’s a school anymore. Andy Ockershausen:	No, I don’t … It’s gone. Coach Bob Milloy:	The church is still there. Janice Iacona Ockershausen	Yeah, church, yeah. Coach Bob Milloy:	But then we went to Blessed Sacrament and we got a house out in Bethesda out Bradley Boulevard, which my mother still lives in. Andy Ockershausen:	Is that right? How many … That’s a long time ago. Coach Bob Milloy:	1953 we moved in. I was 10 years old and she’s still there. Andy Ockershausen:	Must have been a dirt road. Coach Bob Milloy:	Well there wasn’t a lot of trees around in the neighborhood, that’s for sure. So anyway, then I went to Little Flower for three years and after Little Flower I went to St. John’s. I actually did not get in on the first try. The old man knew somebody and I got a chance to take another test and I got in and then made the honor roll. Andy Ockershausen:	How were you commuting then? I know metro, of course, but did you take the bus? Coach Bob Milloy:	No, no, no. We had about three families that went to Little Flower and then the other side of the street they all went to Lourde’s in Bethesda. Dad went to Capital Cadillac every morning so he would drop us off three days a week and then Mr. Cuddy would drop us off another couple days and it all worked out. Andy Ockershausen:	St. John’s at the time, the high school was down on Vermont Avenue. Coach Bob Milloy:	Oh, I thought you were talking about Little Flower. Coach Bob Milloy:	The high school, Dad again dropped me off down at … Because we were at Vermont Avenue at that point and it wasn’t too far from Capitol Cadillac. Andy Ockershausen:	No, that’s right. Coach Bob Milloy:	He would drop me off and then you hitchhiked home. Andy Ockershausen:	Did you play football at St. John’s? Coach Bob Milloy:	Very little. Andy Ockershausen:	But the names I was mentioning to you, there were a bunch of families from Southeast Boys Club that I knew named the Kidwells and several of them were great, great St. John’s athletes, but they were before you probably. They were 40s at St. John’s. Joe Kidwell, he and I went into the Air Force together so that’s where I knew him. Coach Bob Milloy:	I don’t know that name. Andy Ockershausen:	You can find that out and it’s probably too late, but Joe Gallagher knew all those people. I think of so many names when I think of St. John’s and what it’s meant to Our Town, a great, great school. Coach Bob Milloy:	It really was. Back then it was all boys and it was all military. Andy Ockershausen:	Right. We called them post-office people. Coach Bob Milloy:	The Johnny Mops. We were the Johnny Mops. Andy Ockershausen:	Delivering mail in the gray suits, right? Andy Ockershausen:	Oh yeah. Everybody got that job. Coach Bob Milloy:	… Down there by Union Station. It was good stuff. It was a great experience. Andy Ockershausen:	God, I remember that in high school, delivering mail at Christmas time. It was good money, like a dollar an hour. It was found money though, wasn’t it? Boy. Coach Bob Milloy:	We didn’t deliver it. We were pigeonholing it. Andy Ockershausen:	In the place, yeah. Coach Bob Milloy:	They had us up on the fifth floor and you just sorted letters all day long. It was really boring but all your buddies were there with you so it was so much fun. Andy Ockershausen:	Absolutely. Now, of course, all of that is automated, nobody touches the mail. There was a friend of mine I grew up with for years and years named Jack Bumgardner, you might remember that name. He and I worked at the post office every year at Christmas and holidays to get that done. Andy Ockershausen:	But that was Our Town. It was a small town then, Bob, but you knew so many people and that led you … What led you into coaching? You were not a player at St. John’s. I’m sure you were a player but you were not an all-star. Andy Ockershausen:	The coach at Bullis? Coach Bob Milloy:	No, at Little Flower, which is eight grade, CYO, 130-pound Catholic league football. Andy Ockershausen:	Oh, okay. I got it. Coach Bob Milloy:	But it was good, it was real, real serious stuff. Andy Ockershausen:	CYO was … What’s his name, the guy that ran it? Pete Haley. Coach Bob Milloy:	Pete Haley and Paddy Cain. Andy Ockershausen:	Oh yeah. I know them well. Coach Bob Milloy:	They were the bosses then. So anyway, I called up the priest, Father Hughes, and I said: You know, I don’t have anything to do and I’d love to coach a team. He said, “Well, you’re only 18 years old but I’ll keep you around until we can find somebody else.” That was in 1961 and he never found anybody else. Andy Ockershausen:	And you never stopped coaching. Andy Ockershausen:	That’s a fabulous story. Did your brother help you or did they turn you loose? Coach Bob Milloy:	He was on the team. I had two brothers on the team. Andy Ockershausen:	Oh, I got you. Coach Bob Milloy:	They didn’t have a team anymore because they had no coach. So I came in and we went 0 and 5 and it was a great year. Andy Ockershausen:	That’s how Joe Gibbs started, 0 and 5, right here you know. Coach Bob Milloy:	Yeah, but we finished 0 and 5 too. We tied the last game. We were 0, 5 and 1 but a great story out of that is: Back in those days we played our games on the Ellipse. Andy Ockershausen:	So did George Washington University. Coach Bob Milloy:	Well there was three 100-yard fields and then the Monument’s here and the White House is behind you. Andy Ockershausen:	Know it well. Andy Ockershausen:	Rich neighborhood, Little Flower. Coach Bob Milloy:	Yeah, it was pretty wealthy. One of the biggest mistakes of my life is in 1963 there was a guy named Kenneth O’Donnell. Coach Bob Milloy:	He was President Kennedy’s press … No, one of his advisors. Andy Ockershausen:	Oh no, he was Special Assistant to the President. Coach Bob Milloy:	He graduated from Harvard with Bobby Kennedy. Kenny O’Donnell had two great football players that I coached both of them at Little Flower. I’ll never forget it. In 1963 we were playing a game, we were playing Assumption, and we lost and Kevin comes up and says, “You know, we’re going up to see the President, would you like to come?” I went … I didn’t know what to say. I said: No. You know, I thought his dad would have called me if I was going to see the President. I forgot all about it. Tuesday they come and they have these 8 x 10 photographs of these five kids and Mr. O’Donnell and President Kennedy and it was a week before he got assassinated. Coach Bob Milloy:	I could have been in that picture and … Boy, I think about that a lot. Andy Ockershausen:	He sent Kenny O’Donnell … There were several that were part of the Irish mafia that Kennedy brought down from Boston when he went through there. I know Kenny O’Donnell … In fact, in later years his ex-wife was a teacher. She had a great German accent. Remember her, Jan? Janice Iacona Ockershausen	Asta O’Donnell. Andy Ockershausen:	That’s Kenny O’Donnell’s wife that worked for the White House. That was much later, that was in the 90s or something. But Bob, you missed a chance to get started with John F. Kennedy. Coach Bob Milloy:	Yeah. I honestly think about that a lot. I have a copy of that photograph on my wall at home. Andy Ockershausen:	Of your kids. Coach Bob Milloy:	But I’m not in it. That’s the way it is. Andy Ockershausen:	You could do a cutout and put it in there. So getting started then … They advanced you up from Little Flower. How did you get involved with the next step after Little Flower? Coach Bob Milloy:	I stayed there six years. Somebody told me a long time ago: To be happy you’ve got to find out something you love to do and then somehow find a way to get paid for it. I knew what I loved to do and so the next step was: How am I going to get paid for this? The last year I was there in 1966 we had a great team, we had a really good team. We ran the table. We won the city championship. That’s when Joe Gallagher and Maus Collins and Morgan Wootten came to all the games and they were trying to get their kids to go to their schools. Andy Ockershausen:	That’s three legendary coaches. Coach Bob Milloy:	Yeah, they are. At the end of the year two of them offered me a job, Carroll and DeMatha offered me a job and I took the DeMatha job. Andy Ockershausen:	Were you a position coach or assistant coach? Andy Ockershausen:	Because you did everything. Coach Bob Milloy:	… The head JV football coach, the head JV baseball coach. I taught five different periods of algebra. Andy Ockershausen:	Yeah, you were a teacher too, right? Coach Bob Milloy:	And I drove the school bus because our field was like a mile away and somebody had to drive the bus and the kids to practice back and forth. That’s what I did for three years. Andy Ockershausen:	I never knew about your teaching until somebody mentioned to me after I said something about Bob Milloy they said, “Yeah, he taught in one of my classes.” I said: What? You mean Morgan Wootten. He said, “No, no. Bob Milloy.” Everybody who taught out there was on the staff at one time, right? Coach Bob Milloy:	Yeah. Everybody taught. Morgan taught history and Joe taught history, Joe Gallagher. I’m sure Maus taught something too. But then they all started branching out into being athletic directors and got out of the classroom. So anyway, the DeMatha years were terrific. They we’re terrific. Andy Ockershausen:	Well the economics changed too, Bob, because nobody was paying any money then but now … Well that’s of course now is now, but the change in high school athletics came with the ability to generate funds, whether at the gate or sponsors, so they could do more with the teams. All of them that you mentioned became … Gonzaga too, they put them in that mix. Coach Bob Milloy:	Well, Maus, you know, Maus left Carroll under not great circumstances. Coach Bob Milloy:	All he does is go down to Gonzaga and put them on the map and poor Carroll has been struggling ever since. Not a good move on Carroll’s part. Andy Ockershausen:	No. One of our guests here that runs Channel Nine was at John Carroll and was part of that mix there at one time. One of the guys I grew up with, actually my brother and he were like Sleepy Thompson. Did you know Sleepy? Of course. Coach Bob Milloy:	Well, I knew his best friend, John Harvill. Coach Bob Milloy:	I knew John very, very well. Andy Ockershausen:	He was at Gaithersburg, right? Coach Bob Milloy:	He was at Gaithersburg but he went to McKinley Tech. He introduced me to Sleepy and those two were thick, those two were good friends. Andy Ockershausen:	They really were. My friend Charlie Brotman was a friend of Harvill and right until the end, he went to visit him out there. He had a very sad ending, John Harvill did, but a great guy. But you knew all the greats of coaching then. You learned from them. Coach Bob Milloy:	Well, I looked up to them and I learned from them. I watched Morgan … I mean, that guy could sell ice cubes to Eskimos. He could coach anything. He could have coached ping pong if you asked him to, but he was just a people guy. I just watched how he dealt with people and he very seldom raised his voice and he never cursed, but he would say to Adrian Dantley, “Come on Mary Alice, you’ve got to try a little harder.” Those guys would go through the wall. He was the master of it. Actually, there’s a movie out on Morgan that I went to at the Avalon Theater on Wednesday. Andy Ockershausen:	Was it the ESPN movie that I heard about? Coach Bob Milloy:	It was like a 30 on 30 type of thing, I don’t know, but it was a real movie. It was at the Avalon Theater Wednesday night. Andy Ockershausen:	On Connecticut Avenue. Coach Bob Milloy:	Yeah. I figured it was something for the Liver Foundation but no, the guy said, “This is for the Avalon Foundation. Give me your $12.50.” But it was a terrific movie and he was there and he spoke to the crowd. Mike Brey was there and Danny Ferry and a lot of his ex-players were there. Andy Ockershausen:	What happened … I want to get into that later about what happened at DeMatha, but at St. John’s they had some great coaches and some great teams but they never reached the level of DeMatha. But now, evidently, St. John’s has come to a point where they’re getting very competitive with DeMatha. Coach Bob Milloy:	Kevin Plank. He went there and so forth. Andy Ockershausen:	Jim Kimsey too. There was a lot of guys … You know Kimsey AOL. Janice Iacona Ockershausen	Joe Roberts. Coach Bob Milloy:	Roberts and Fernandez is another one. Coach Bob Milloy:	They were all … Those are the St. John’s guys that made it. Andy Ockershausen:	And they didn’t turn their back on the school, they all helped the school. Andy Ockershausen:	Where will they play? Coach Bob Milloy:	I think they’ll play at DeMatha this year, but they’ll probably play twice. Andy Ockershausen:	DeMatha has a stadium? I didn’t know that. Coach Bob Milloy:	No, they rent a field next to FedEx. Andy Ockershausen:	Oh, they rent it. Coach Bob Milloy:	Yeah, at the … It’s like a public field right next to FedEx. Andy Ockershausen:	Well we’re going to take a break and when we come back … I remember when Gonzaga used to play over at River Terrace to practice. They’d take the kids over there by the bus all the time. Andy Ockershausen:	At River Terrace. I ended up showing that to Janice the other day. It was the tenderloin then. If you went in, you went in with a gun. We’re going to take a break. This is Andy Ockershausen and this is Our Town. 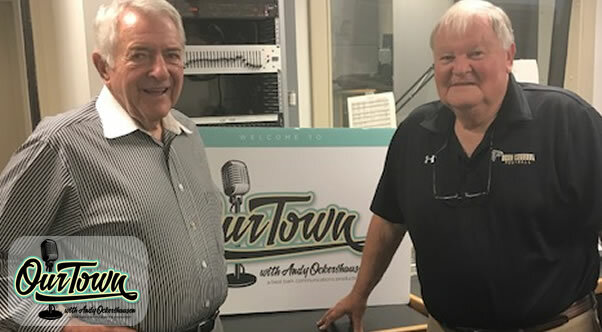 Andy Ockershausen: This is Andy Ockershausen and Our Town talking to Bob Milloy. He’s got a million stories about Our Town and we love all of them. Before he was big in the high school he coached Catholic school, then he went legitimate and got into the public school system of Montgomery County, became the winningest coach in history for Montgomery County schools. Is that correct? Andy Ockershausen:	Yes it is. Coach Bob Milloy:	That’s correct. I was at DeMatha three years and I’ve got another great story about Morgan. He would sit there in his office, you know. You’re in that office and you could be Digger Phelps and Dean Smith and John Wooden and it’s just unbelievable. It was an everyday occurrence. But he said to me one day he said, “Bob, you know, you’ve been here three years. When you’re ready to make a move let me know and I’ll see if I can help you.” So the next year a guy called and said the head coach at Whitman had retired and they were looking around for a coach, which is really in my neighborhood. The kids in my neighborhood went to Whitman High School. Andy Ockershausen:	Right. That’s close to you. Coach Bob Milloy:	So I go into Morgan and I said: Hey, I’d like to apply for that Whitman job and you said you would help me. He says, “Well who’s the principal over there, Bob?” He knows who the principal is, right? That’s the game Morgan plays. Andy Ockershausen:	Morgan recommended it, that’s all the president needed. Coach Bob Milloy:	He was Morgan’s principal at Blair, so Morgan knew him very well. He didn’t tell me that, he wants to know who the principal of Whitman was. He knew it was Dr. Shaw. Andy Ockershausen:	He knew it all, right. He was testing you. Coach Bob Milloy:	He was just messing with me. Andy Ockershausen:	That moved you then to the public school system. Coach Bob Milloy:	I was there. My first head job was 1970 and we had the first winning season that the school ever had. A lot of my Little Flower kids were there too anyway. We had some good players. We had Bobby Raba who got to the NFL for five years. I know you’ll know this name: John “Tree” Adams. Andy Ockershausen:	Oh yeah. His son. Coach Bob Milloy:	His dad was a great Redskin. Andy Ockershausen:	He was a builder,wasn’t he? John Adams. Coach Bob Milloy:	I don’t know. Builder and real estate guy. Coach Bob Milloy:	John turned out to be … He got a full scholarship to West Virginia. He played a couple of years in the league. Andy Ockershausen:	Whitman was a new school practically then, wasn’t it? It served Kenwood Park and Kenwood and everything. Andy Ockershausen:	They called it the Hoi Polloi school. Coach Bob Milloy:	I loved it. I really liked Whitman because I knew a lot of the kids, but they were really good and swimming and tennis and golf and football wasn’t real big to them over there. Andy Ockershausen:	No, I heard that. Coach Bob Milloy:	About four years later a guy I coached with at DeMatha by the name of Joe Beerman, he was now the AD at Springbrook. He called me up and he said: Our guys left and would you be interested in transferring over the old Montgomery County? I said: Yeah I really would, because they really excelled in sports over there. So I went over there and I got that job and so I was there 18 years at Springbrook. Coach Bob Milloy:	18 years. Yeah. It was a great place. Andy Ockershausen:	I think one of your players was Mr. Shawn Springs. Coach Bob Milloy:	Shawn Springs. Well that’s a funny story, too. I was sitting in my office one day and the phone rings and says, “Coach Milloy?” I said: Yeah. He said, “This is Ron Springs at the Dallas Cowboys.” I said, “Okay, who is this?” He goes, “No, it’s Ron Springs.” I said: Really? He says, “Yeah. I just took an assistant coaching job at Howard University. I have a son named Shawn, he’s a Division I football player. We’re moving in the area and we want to see your school and then we’re going to take a look at DeMatha and then we’ll make our decision.” So I said: Okay. So he shows up and I’ve got this friend of mine, Dominick Mantua, he owns Dominick’s Pizza Parlor right down from the school and we used to go there all the time. So I’m ready for him, right? So we get Ron Springs and we’re having a few adult beverages and pizza and spaghetti and anything else you wanted. Dominick’s also a real estate guy so about three hours later we’re driving all around White Oak going into houses, showing him houses. Andy Ockershausen:	Showing him the neighborhood, right. Coach Bob Milloy:	It was dark, he couldn’t see anything anyway but … So anyway, then he did go to DeMatha and, of course, Bill McGregor did a great job. Shawn ended up coming to our school. The only reason was we had girls and DeMatha didn’t. Coach Bob Milloy:	We ended up with one of the greatest players in the area. He went on to Ohio State and played many years for the Redskins. Great, great guy. Andy Ockershausen:	Now he’s developing a helmet. He’s a very dear friend of ours and he’s been a great … He went to work for us at Home Team Sports, or then it was Comcast. But Shawn is developing a helmet, as you probably know about. Coach Bob Milloy:	Yeah, a little bit. Andy Ockershausen:	He’s selling the shells and so forth. Anyway, he’s got a life after football. He’s in the trucking business. He’s an example of an athlete that used that athletic ability to get into other things and he’s done real well. I’m sure a lot of your kids have done that over the years. Coach Bob Milloy:	Oh sure. He’s just a people guy. Coach Bob Milloy:	He’s friendly to everybody. He’s never hot-headed at anybody. Andy Ockershausen:	Smile, smile, smile. I call him Mr. Smiley. Coach Bob Milloy:	He never forgot where he came from. He likes to talk. Andy Ockershausen:	Oh, he does. We love him. Coach Bob Milloy:	He’d be good in the media business. Andy Ockershausen:	You had 18 years at the great, the players there. Coach Bob Milloy:	Mm-hmm (affirmative). Andy Ockershausen:	We had one of the Fears boys I think played for you there, Ernie Fears’ son, then he went to UVA. Coach Bob Milloy:	No, I don’t know him. Andy Ockershausen:	It might have been another one. Then you went to Sherwood. Coach Bob Milloy:	Well yeah. Then after 18 years my kids were in middle school and the Sherwood coach retired and my wife, Susan, she said, “You need to come out here.” I didn’t want to leave Springbrook, it was home to me. Andy Ockershausen:	Were you living in the area? Coach Bob Milloy:	I actually lived in the Sherwood area and had been for 15 years. Andy Ockershausen:	But you were commuting then. Coach Bob Milloy:	Commuting, and … Anyway, we talked about it and I thought: Well, I have to do this or I’m not going to have a family anymore. My wife would have divorced me. I applied for the job and we got the job. It turned out I had seven coaches, me and six assistants. All seven of us had kids on the team at the same time. Coach Bob Milloy:	Which is a little hairy every now and then. You know, if some kid doesn’t play … It’s a little hairy. Coach Bob Milloy:	But it turned out to be … Because we were good. We got good. Andy Ockershausen:	And stayed good. Coach Bob Milloy:	We won two state championships. Andy Ockershausen:	How did you do … You did good at Springbrook too. You won there? Coach Bob Milloy:	Yeah, we won a lot there. We won a lot of games there. Andy Ockershausen:	And you won a lot at Sherwood. Sherwood’s in Olney, right? Coach Bob Milloy:	Sherwood was in Olney where I lived ten minutes from the school. It was a real, real great move for my family and for all of us. It really turned out well. Andy Ockershausen:	And you won state titles there too? Coach Bob Milloy:	Won two at Sherwood, six at Springbrook. Andy Ockershausen:	You’re piling them up. Coach Bob Milloy:	It’s year 31 and I’ve got my retirement locked in at Montgomery County and I’m thinking that … Well funny story about Sherwood. I got to coach my three children. Brendan played tackle for me and then Robbie played tackle and both of them were part of state championship teams. Kelly comes along and she’s a girl lacrosse player. Coach Bob Milloy:	My daughter, my daughter Kelly. Andy Ockershausen:	And a great sport, too. Lacrosse for women, right? Andy Ockershausen:	She’s better than you. Coach Bob Milloy:	So I took the job. I never saw Cilento again, but we had so much fun. Andy Ockershausen:	You must have had a wonderful life. Coach Bob Milloy:	Two years in a row, and we got in the playoffs both years. The only bad thing about it, we had beaten Damascus in their senior year. The playoff game, we beat them good. The playoff game was the day after the senior prom and those girls, they decided: I’m making a decision. I’m going to the prom. The next day they played like they were underwater, and I’m still mad about it. Andy Ockershausen:	But the girls had a good time. Coach Bob Milloy:	Not at the game. They had a good time at the prom. They didn’t have too good a time at the game, we got shellacked. Andy Ockershausen:	In all your career, in addition to getting … We’ll get into Good Counsel in a minute, but what magic did you have to make these kids win? Because you’ve got players everywhere but some won and some didn’t and it’s true in schools, correct? Some schools have players and don’t win, some schools have players and win and you always won. Andy Ockershausen:	From the top. Andy Ockershausen:	There’s no difference in any endeavor, whether it’s business, football, finance, it always starts at the top. Andy Ockershausen:	It does, and it comes down. There are certain organizations that never make it because the top is not doing right. Some of them always make it because of the top and that’s true of your career. Because the schools are all different, the neighborhoods were different, the people had to be different, but you won. That’s marvelous. Coach Bob Milloy:	Thank you. Andy Ockershausen:	Well, I mean it happened, it’s the record. Then you end up going back to your Catholic school. Andy Ockershausen:	You took your pension with you? Of course. Coach Bob Milloy:	Well, I retired and I’m sitting in the office and the President of Good Counsel calls and he says, “You know, our guy’s retiring and would you be interested in coming over here?” I said: I don’t know. Andy Ockershausen:	Were you still working at Sherwood then? Coach Bob Milloy:	Oh yeah. I had five algebras and coaching varsity football. I said: I don’t know. I’m getting near the end. He said, “Well, you know, there’s no teaching.” I said: Well, when’s the interview? Andy Ockershausen:	He didn’t want you to teach, huh? Coach Bob Milloy:	No, he just wanted me to beat Gonzaga. He had a real thing with Gonzaga. So anyway, I went over there and I signed up and it was great. Andy Ockershausen:	It was close to where you lived too, wasn’t it? Coach Bob Milloy:	I’m five minutes away. Free parking, free lunch, how do you beat that? Andy Ockershausen:	Yeah. You could go home for lunch. Your wife didn’t like that, of course. Andy Ockershausen:	How many years at Good Counsel? Andy Ockershausen:	It’s your life. It’s wonderful. Whoever talked you into it did the smart thing. It’s made you stay young, Bob, and that’s because you work with young people. Coach Bob Milloy:	No question. There’s no question it keeps you … You just laugh with them and you go out and have fun with them and you cry with them too. Andy Ockershausen:	People always remain, don’t they? Coach Bob Milloy:	… And the coaches and the parents. It’s always going to be there. Andy Ockershausen:	In all the years … And Good Counsel you began the one in the, what is that WCAC? Coach Bob Milloy:	WCAC. That’s a different deal . . . DeMatha and St. John’s, Gonzaga and Carroll. They’re pretty good teams. Andy Ockershausen:	But that’s good for you too, isn’t it? That competition. Coach Bob Milloy:	Well, it’s a financial thing. Andy Ockershausen:	You recruited, did you not? Coach Bob Milloy:	You had … Oh, absolutely recruited. In our league, though, you can give kids financial aid as long as they show need. Andy Ockershausen:	Find a way to finance them. Coach Bob Milloy:	Find a way to finance them, yes. That’s the hardest part. Andy Ockershausen:	No question about it. A lot of these kids can’t afford it and a lot of them can and don’t follow through on it. We’re going to take a break here and come back and talk a little more about Good Counsel. You’ve won Montgomery County and now you’re going to win the hearts and the minds of the good Catholics. Andy Ockershausen: Our Town. I’m talking to Bob Milloy, the legend coach in Maryland, the state of Maryland, but became a bigger legend in a tougher world at Good Counsel. Now that must have been tough for you recruiting, Bob. Coach Bob Milloy:	Well it was hard. You had to go to the games and, of course every parent, their kid is probably the greatest player that’s ever been to the game and so you went down a lot of cul de sacs on those roads. But it’s not hard to find good players but then they have to academically get in and they have to afford it. Andy Ockershausen:	Was that a tough school academically? Coach Bob Milloy:	Yeah, pretty tough. We held to standards pretty well and it’s a good school, a real good school. Andy Ockershausen:	St. John’s was tough but only because of the ritual, the uniforms in them when you went to school. Gonzaga, I grew up in the North East when Gonzaga was always a tough Jesuit school but the kids we’re smart they went to all the … So you could make football players out of them if they’re smart. Coach Bob Milloy:	Yeah. You’ve got to have brains to play football. Andy Ockershausen:	Now what do you think about … Talking about brains, this is the headline in the Washington Post about the new research that kids shouldn’t start playing football until they’re 12, after 12 years old. This is a big thing that’s going on in our society now, kids playing football. You know that. Coach Bob Milloy:	Yeah. It’s affected … It’s definitely affected the high school game. I had camps every summer and a lot of mothers don’t want the kids playing football, so the attendance in the camps has fallen off and football has too. We used to have three teams with Good Counsel, freshman, JV and varsity. Andy Ockershausen:	You’re much more careful. Coach Bob Milloy:	Yeah. If any kind of hard hit, they talk to the kids and they have protocols they go through and they won’t let them back in. Medicine’s catching up and I still … I would let my kids play in a heartbeat. You’re going to have injuries, you’re going to have injuries on skateboards and … We have more concussions at Good Counsel in volleyball than we do football, honestly. Andy Ockershausen:	Wow. What appears to me is watching high school and college athletics, basketball they’re on the floor as much as anywhere and there’s nothing, no pads. They’re hitting on their face, their arms, their hands, on the hardwood. Basketball players go down all the time. Andy Ockershausen:	I don’t hear about injuries in basketball. Coach Bob Milloy:	Not so much. Andy Ockershausen:	All I hear about is football. Andy Ockershausen:	It’s because it’s popular, Bob. Coach Bob Milloy:	Well that … The media. Coach Bob Milloy:	It’s probably the media. They’re on a hunt now. Andy Ockershausen:	Good stories. Right. Coach Bob Milloy:	They’re on a hunt, but I don’t think they’re ever going to get rid of football. Andy Ockershausen:	No. I hope not, because it’s been good for our Country and certainly good for Montgomery County and for you. What is in your future now? You’re not coaching anymore but you’re still on the staff. Are you still helping out there at Good Counsel? Andy Ockershausen:	You’re not coaching lacrosse anymore. Andy Ockershausen:	They had a big party for you. We know about that. Andy Ockershausen:	Take care of the kids in school. Coach Bob Milloy:	Yeah. Monitor the kids in study hall. I’ve got a lot of friends there and I enjoy the kids. All the kids on the team played for me last year and all the coaches pretty much coached for me last year. Andy Ockershausen:	But you don’t coach them anymore. Coach Bob Milloy:	Not at all. Coach Bob Milloy:	I look at the films and the coach calls me once a week and gets my opinion on some things. Coach Bob Milloy:	Whether he uses it or not, that’s up to him. Andy Ockershausen:	So you keep your hand in a little bit, right? Coach Bob Milloy:	A little bit. Yeah. Andy Ockershausen:	I can relate to that because what’s made my life so spectacular is keeping my hand in because Janice insists that I do this and we’ve had so much fun with Our Town. Meeting people like you to talk about Our Town has been a revelation. And also we feel that it’s an important part, this is a history that there’ll be a Bob Milloy history in Our Town and maybe people won’t listen to it but they will. Sooner or later, maybe. It’ll be up there forever, Bob. ‘Up there’ means somewhere, I don’t know where it is. Janice Iacona Ockershausen	The cloud. Andy Ockershausen:	There’ll always be a Bob Milloy Show. There’ll always be an Our Town. Coach Bob Milloy:	I appreciate that. It’s very nice of you to … I’m humbled to be here with the names that you’ve had on the show. How you came across me, I have no idea. Andy Ockershausen:	Come on Milloy. Coach Bob Milloy:	But I’m enjoying it. I am enjoying it. Andy Ockershausen:	We know all about you. I did not know until we met that Pete Milloy was your dad. If I’d have known that from the beginning I’d have been following you from step to step to step, especially with Jimmy Milloy too. The Milloys made a big impact on me and Our Town in the 50s, the 60s and you made a huge impact in the County, now you’ve done it at the Catholic school. What’s left for you? I’ve got a couple of rabbis I’ll call. Coach Bob Milloy:	Well you know, Dad’s family grew up on Rittenhouse right off Chevy Chase Circle. Andy Ockershausen:	Sayonara. We we know . . .
Coach Bob Milloy:	The gate of Heaven. Andy Ockershausen:	We know about … Hearing about your years at Good Counsel and St. John’s, we just love talking about Our Town, as you can well imagine. I know you love it too. You stayed here. You could have gone other places, Milloy, I know that for a fact, but you stuck with Our Town. Whether it’s … I tell everybody, whether it’s Vienna, Virginia or Annapolis or whatever it is, Branch Avenue, it could be McLean, it’s still Our Town. Our kids came from all over to do things. I’m sure that happened to you at Good Counsel. You had kids from other regionals, correct? Coach Bob Milloy:	Frederick, Baltimore, PG County, KLM. Andy Ockershausen:	Good school, though. Coach Bob Milloy:	DC. It’s a wonderful school. Andy Ockershausen:	You made them work. Coach Bob Milloy:	It’s a wonderful school. Janice Iacona Ockershausen	Stu Long. Coach Bob Milloy:	Stuart Long. Andy Ockershausen:	Stuart Long was a big benefactor at Gonzaga. He built the football field at Gonzaga by the District of Columbia and nobody … He was on the Armory Board. You see that nice field they built at Gonzaga? Stuart Long. Coach Bob Milloy:	Oh yeah, it’s beautiful. Andy Ockershausen:	It’s right in town. You could go to church and play football the same day. Coach Bob Milloy:	I’ve got to tell you a story about your old friend Joe Gallagher. Coach Bob Milloy:	We’ve been doing service work with our school and so I’d take 15 kids and put them on a bus and we’d go to Friends House or Asbury Village. We ended up at Grace House one day. The lady said, Meg, “Have the kids go in the library. I’ll get all the residents down.” It was Ice Cream Sundae day and that’s what you do. You go in there and everybody has a resident and you make them an ice cream sundae and you just talk to them. Andy Ockershausen:	What a great thing for the residents. Coach Bob Milloy:	It was great for the kids. Coach Bob Milloy:	The bus ride over and the bus ride home was totally different. Coach Bob Milloy:	It worked on our kids. But anyway, so I go in there and I see this old man on a walker and he’s talking to these kids and nobody’s … Complete silence. He’s talking and it’s Joe Gallagher, right? I didn’t even know he lived there, but he’s there and he’s telling them, he says, “You know, I used to coach this game. As a matter of fact, in 1962 I played a game in front of 50,000 people twice.” You know, St. John’s eastern in the city title game when they had the big riot and everything. Coach Bob Milloy:	Those kids didn’t have any idea who he was. So I said: You know what? On the way home I said: Google Joe Gallagher. Come back and tell me what you find out. I said: That was the real deal there. Andy Ockershausen:	Oh, I bet. Coach Bob Milloy:	That was the real deal. Andy Ockershausen:	What a revelation for these young men. Coach Bob Milloy:	So anyway, he goes back in his room and he didn’t want to come out that day, and so I went back and I said: Coach, can I get you an ice cream sundae? He goes, “Yeah.” I said: What do you want on it? You want syrup, little sprinkles? “No, just syrup.” I said: How about a strawberry? “Just syrup.” Any pineapple or anything like that? He said, “Syrup!” Yes, sir. So I’m in his room and he’s got like eight hall of fame plaques all over the place, you know? But all he talked about was he was in Guadalcanal as a Captain in the Marines and that’s all he wanted to talk about that day. Andy Ockershausen:	What a background, Joe Gallagher. Andy Ockershausen:	Well it was a great idea of yours, Bob Milloy, to do that because the winner were the kids. See, other people will forget it because their memory is not very good, but for the kids it’ll stick with them forever. Coach Bob Milloy:	It was a … The bus ride home was solemn, you know what I mean? Andy Ockershausen:	After seeing life. Coach Bob Milloy:	It really had an effect on them that they had done something good. Andy Ockershausen:	You made them better students, better people and eventually better football players. That’s your secret, Bob Milloy. You’re a good man and it shows in your kids. We’re delighted to have you on Our Town. You’re an important part of a lot of people’s lives in Our Town and I hope they all listen. This is going to be up there forever, Milloy. Andy Ockershausen:	Tribute to your father, great guy, Pete Milloy. This is Andy Ockershausen. And a special thanks to our technical director, Ken Hunter, who went to Oklahoma State. He didn’t mean it, but he couldn’t get in a good school. Ken, we’re happy for you and happy for Bob Milloy and happy for Our Town. Announcer: You’ve been listening to Our Town: Season 3, presented by GEICO, our hometown favorite, with your host Andy Ockershausen. New Our Town episodes are released each Tuesday and Thursday. Drop us a line with your comments or suggestions. See us on Facebook, or visit our website at ourtowndc.com. Our special thanks to Ken Hunter, our technical director, and WMAL radio, in Washington, D.C. for hosting our podcast. And thanks to GEICO, 15 minutes can save you 15% or more on car insurance.